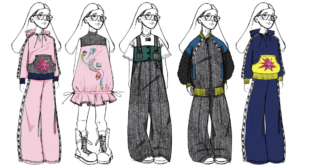 Third year students Cara Edden and Hana Hussein won the £3,000 first prize at the showcase event that took place at Somerset House last Friday, February 15th 2019 as London Fashion Week kicked off in the capital. The collection features three different handbag styles, each of which reflects the individual characteristics and personality traits of the crime fighting trio. It is part of a trench of new signings for the popular animated series with partners joining from around the world as the brand celebrates its 20 anniversary this year. The British designer's first ever womenswear range featuring the CN collaboration was debuted on the eve of London Fashion Week. The new capsule collections include t-shirts, dresses, handbags and accessories.